My participation with this fanzine started by meeting Joey. In a short time I saw a young man on a mission. A mission, a vision quest, a person following his inner voice, cashing good ideas, all with the strong desire to do something BIG! BIG PLANS! I liked that. Plus he is a very decent person. I like his idea of community, and his work towards building a community. And he is running this whole growing concept as a successful, self-sustaining, independent business. I am impressed. A part of my work is building a community and saving a community. I have a photo, video, ephemera archive consisting mostly of the Lower East Side. One of my goals with the NY ACKER Awards is to build an abstract, name, bio, a short history, community. A growing tree filled with names of creative people who have added to the history of the avant-garde, in fields like music, film, writing, art, publishing, ideas, community work and so on. Save, the names along with a bio and a piece of memorabilia in a box, follow the names and you have a creative community. The books I am getting published are a peoples history of a creative community. Doing this fanzine with Joey is another way to give life to a community. This fanzine will help connect creative people together, as well as, inform the public who these community people are. And one of the root questions that helps tie everyone together is: "what has been one of your larger struggles"? Fighting, struggling, is one of thé conditions one must accept to living in NYC. Life in NYC is always' connected to some kind of struggle. What can I say, the last two years have definitely been a long strange fun journey. 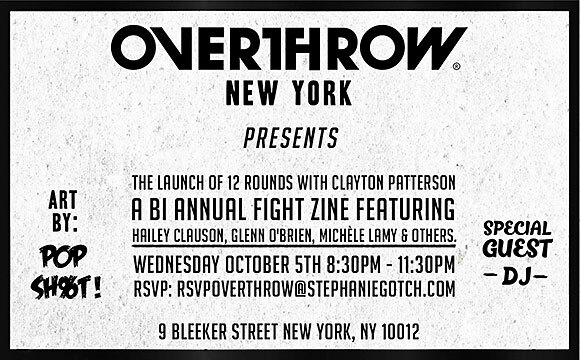 Overthrow New York is a fusion of many people, places, and experiences. y foray into boxing started with an impromptu tutorial in a Lower East Side Park from my close friend Sidney Smith , who saw I was getting beaten up too much at the basketball court. Needing to learn more I headed to a boxing gym where I met Charlie Himmelstein and was introduced to the world of Friday Night Throwdown and underground boxing. With my hunger growing I was lucky enough to become the pupil of Carlos Castillo who poured gasoline on my boxing flame. Carlito taught and shared his infinite boxing knowledge and wisdom with me. He made the sport more about thinking and life then just something physical, which in turn made me fall in love with the sport and its life metaphors. It was during this time that I stumbled upon #9 Bleecker. The first time I walked into #9, it looked and smelled like a bomb had gone off. I knew it was perfect from jump street. It was perfect to create a boxing club, a community, a movement. #9 Bleecker was long time home to the Abbie Hoffman founded Youth International Party, the Yippies. For over thirty years political activism, counter culture, and exchange of ideas happened in the building and the neighborhood. Across the street at 10 Bleecker the Yippies had a warm up spot for CBGBS called Studio 10. The boxing club’s name came from the stack of 40 year old newspapers I found when I first entered #9. The Yipster Times, which later became Overthrow (where Tom Forcade started and created High Times) was published on the 2nd and 3rd floor of the building. Unsung heroes like Alice Torbush, Dana Beal, and Aron Kay literally Fought the Power during the 60’s, 70’s, 80’s, 90’s and are still doing it today. Things have changed, for better or worse? It is not up to me to decide. But although the torch has been passed (whether they wanted to or not) it was extremely important for me to create a culture which represents the past, present, and future. 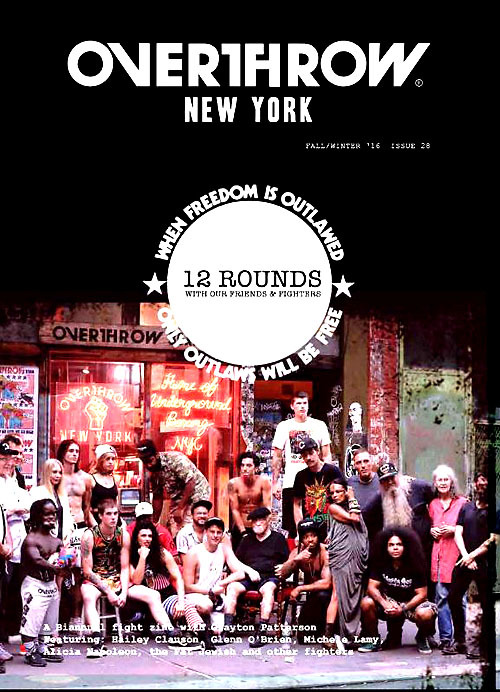 Overthrow New York is melding of my experiences at the West 4th Street Basketball Courts, the hipster underground boxing world, the real boxing world, and the activist counterculture history of #9. Overthrow is raw, real, and unable to be labeled. Is it a real boxing gym? Is it boutique fitness? Is it a place for artists? Is it models boxing? Is it a place to hangout! Is it real New York? Overthrow is whatever you want it to be for you! There are a lot of people who go unnoticed behind the scenes that make Overthrow Boxing special, but there is no one more important then John Gagliano who is responsible for the layout and design of 12 Rounds (with a little help from a mystery man). I hope everyone enjoys the first of Overthrow’s 12 Rounds and look forward to where everything will be in the next few years. Overthrow New York offers a high intensity anaerobic workout that combines fundamental boxing techniques like shadowboxing, heavy bag and footwork, with weight training and high energy music for an epic alternative to any basic gym session. Each 45 minutes class is held either on the main floor in their regulation boxing ring or in The Underground— 9 Bleecker’s infamous basement level, formerly an after hours club and countercultural hotspot. All levels are welcome! "I was with John Lennon in Washington Square Park," aging rocker David Peel tells me, almost upon saying hello. "He taught me ‘No excuses, if you’re gonna do something, just do it.’"
"The bigger metaphor is ‘What are you fighting for?’" (um…abs?) says founder Joey Goodwin, 30, a fashion and marketing entrepreneur who co-founded clothing brand Unruly Heir before throwing his hat into the boxing ring. Goodwin, for his part, sees himself as paying tribute to that history by keeping it front and center at Overthrow. "It could have been a SoulCycle," he likes to say. (Or a John Varvatos store…a la CBGBs.) "I was riding my bike to West 4th when I saw the building, I came in and did a lot of research on it, and it’s just super crazy history." And while other new boxing workout studios are trying to give the sport a more polished boutique-fitness presentation, Goodwin is keeping it real, with few amenities, old metal lockers, and a space that generally feels more like a dive bar than a gym. "Boxing is tough. If you clean it up completely, you’re not being honest with it," he says. Oh, and on Friday nights, Overthrow offers Boxing & Booze, where the sweat session is followed by drinks. Maybe the walls will talk, and a revolutionary idea or two will be inspired?